Momentum MCs Elise White, Lititz, Pa; Josh Hastings, Columbus, Ohio; and Josiah Shank, Elkhart, Ind. 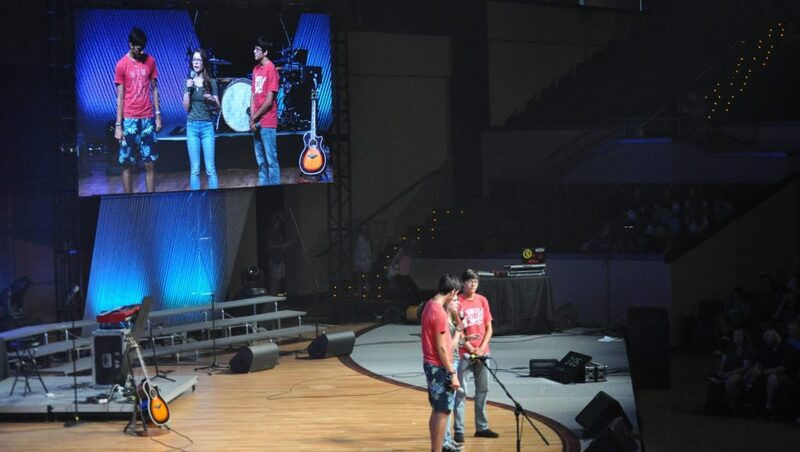 Momentum’s student masters of ceremonies, Josiah Shank, Elise White, and Josh Hastings, have a front-row seat to each main session at the week-long youth conference. At each event, they capably handle recaps of the day’s events and introduce the session’s speaker. Each submitted an audition tape to be selected for the role, though Josh admits his youth pastor at Grace Polaris Church, Westerville, Ohio, Dave Nicodemus, surreptitiously videoed Josh leading the middle school ministry and sent it in. 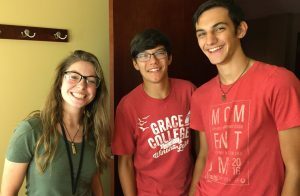 The trio hit the ground running upon arrival at Momentum this week, learning quickly each day what is expected of them. Do any of them plan to leverage the experience into a career as an announcer? Probably not, they say, though Josiah, who attends Grace Community Church in Goshen, Ind., thinks it might help him later on. “I love the experience because I want to be a pastor,” he says.